#WeAmaze – Week 1 Winner! Hi everyone! The time has arrived to announce the first weekly #WeAmaze winner. 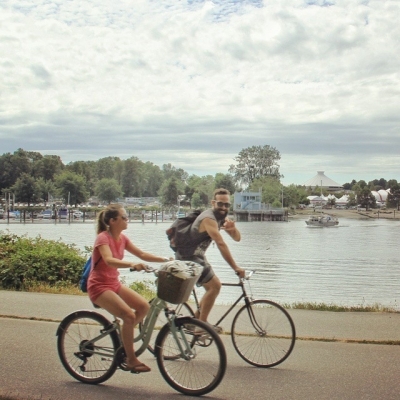 This week, I was drawn to this awesome photo of smiling cyclists on the seawall by Marina (@lostincreamtea). Did you know there are over 200,000 bike rentals made per year in the West End? Summer is the perfect time to hop on a bicycle and make your way around to numerous West End hotspots. Marina has won a gift certificate for dinner at Beach Bay Café and dessert at True Confections on Denman, thanks to contest partner Intracorp and The Jervis. Additionally, Marina is now in the running for the chance to win the grand prize of a new Electra Loft bicycle from Denman Bike Shop at the end of the summer.